Beautiful art by Barbara Kaufmann, and presentation by tinywords. Thank you. Great match between poem and pic. Really well done. Besutiful Haiga, lovely picture, a great sense of serenity and solitude. Barbara, I've been in front of this beautiful haiga for quite a long while. 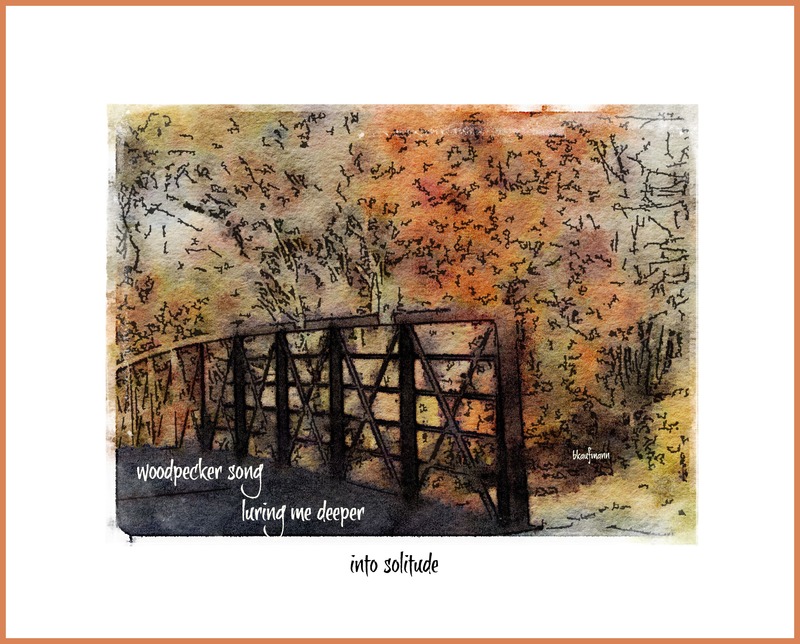 The autumn painting with its bridge leading off-stage, together with the song of an unseen woodpecker leading beyond the frame, have lured me 'deeper into solitude' too. The match of painting and poem, visual and aural, is superb! It has resonated deeply. Thank you. I's very nice picture but I'm not understand, what you understood us.